Whatever happens with the election on Thursday, the struggle against racism and fascism will continue. 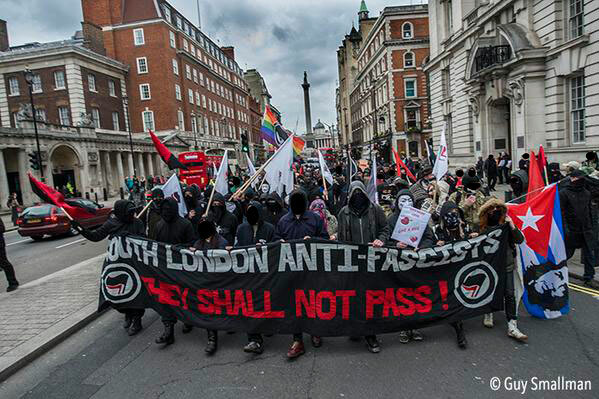 Indeed it will continue with hardly a pause as Saturday May 9th sees two major mobilisations for anti-fascists in Dudley in the Midlands and Walthamstow in East London. And whatever happens to UKIP in the election, the tide of racism and xenophobic anti-immigrant hysteria that they have both ridden and helped create will not disappear after polling day. Its toxic legacy will be long-lasting and we will be dealing with an increase in racist and far-right attacks because of it. All the main parties have gone along with this shift to the right, towards more nationalistic, Islamophobic and xenophobic policies. Whoever wins the election, this is the political landscape we will continue to operate in and continue to resist. Real change comes from community self-organisation and direct action on the streets. Saturday will see plenty of opportunity for that. Join us to build practical solidarity and take action against racism, fascism and Islamophobia. On Saturday 9th May, Britain First will be marching in Dudley against allegedly-proposed plans to build a “mega mosque” in the town. For Britain First, the proposal of a so-called “mega mosque” is an opportunity to gain more traction for their repugnant views in the Dudley area. For many, Britain First are just a minority of far-right activists who are mostly harmless- but, it doesn’t take long before the likes of Britain First and other fascist groups grow bigger and bigger, spreading fear, intimidation, division and hatred in our local communities. The development of far-right groups all over Europe who have neo-Nazis within their ranks prove this. Britain First do not care about the needs, or the conditions of working class people. Fascism divides the working class on the basis of race, ethnicity and religion, rather than taking aim at the very system that leaves working class people in the cold. Britain First are committed to attacking and frightening marginalised groups, such as Muslims and Roma people. 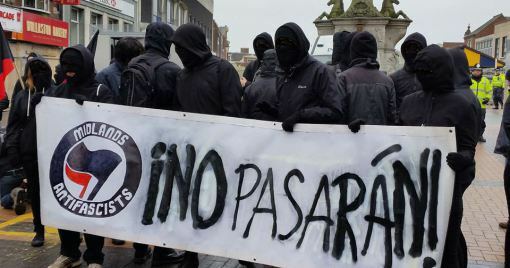 Their march in Dudley will be a display of their supposed “supremacy” over Muslims and people of colour, but we cannot let this fool us- fascists rely on fear and intimidation in order to cement their prominence in our communities, and we must resist this wherever possible. On May 9th the EDL hope to make their return to Walthamstow in East London. Their reasons for marching have become redundant and irrelevant; an EDL march is one thing: a violent, racist mob which seek to intimidate, harass, and attack communities in the name of reactionary nationalism. They state that on May 9th they intend to “make it clear we CAN and WILL protest in any town or city in this great country of ours!”. The last time the EDL attempted a march in Walthamstow they were met by fierce community resistance which refused the limits imposed by both the police and polite protest and went ahead to meet them with force. It was a disastrous and embarrassing defeat for the EDL and an example of the collective strength of black, brown, and white working class people fighting against a common enemy. The decision to return to Walthamstow could not come at a more ill-advised time for the EDL. Their callout has been met with derision and criticism from across the far-right and from within the ranks of the EDL itself. One racist Facebook group have called it “the dumbest idea we’ve heard in a long time”, adding “last time there were a good few hundred lads who could defend themselves. They are all long gone”. With the loss of any semblance of competent leadership, and the diminishing morale of their support base, the EDL is on it’s last legs. On May 9th we believe we have an important opportunity to deliver one of the final blows to the EDL and finally wipe this decrepit movement off the streets. We are calling for large scale mobilisation to prevent the EDL march from taking place, by all means necessary. We are calling to #BLOCKEDL in Walthamstow. Help spread the word and start making plans.